Scooby Dooby Doo and the Cyber Chase 2001 Stored Well, working. Disney The Tigger Movie - Stored Well, working. thorntongiftsstore has no other items for sale. Details about Heidi Disney 2001 Stored Well, working. Heidi Disney 2001 Stored Well, working. 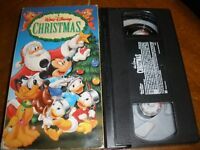 Walt Disney A Goofy Movie VHS 4658. Please pay as quickly as possible and we will return the favor with shipping performance.